Expand your kitchen to include the great outdoors; by adding a Built-In LEX 485 Grill Head. Three stainless steel tube burners provide even heating. Use one, two or all three burners to bake, sear and even smoke on this versatile grill. High quality stainless steel cooking grids retain heat and produce the iconic Napoleon wave sear marks. Napoleons JETFIRE ignition system makes sure that your grill lights every time by shooting a jet of flame to light the burners. Napoleon's Executive 3 Piece Toolset is made from cast stainless steel with comfortable ergonomic handles. The large spatula is perfect for steaks and other large food with its bladed tip and serrated edge. The easy-lock stainless steel tongs are always ready for action, their comfortable grip making it easy to hold and move your grilled delicacies. Don't forget to splash on the sauce with the silicone basting brush. Be the boss of your grill with the Napoleon Executive 3 Piece Toolset. 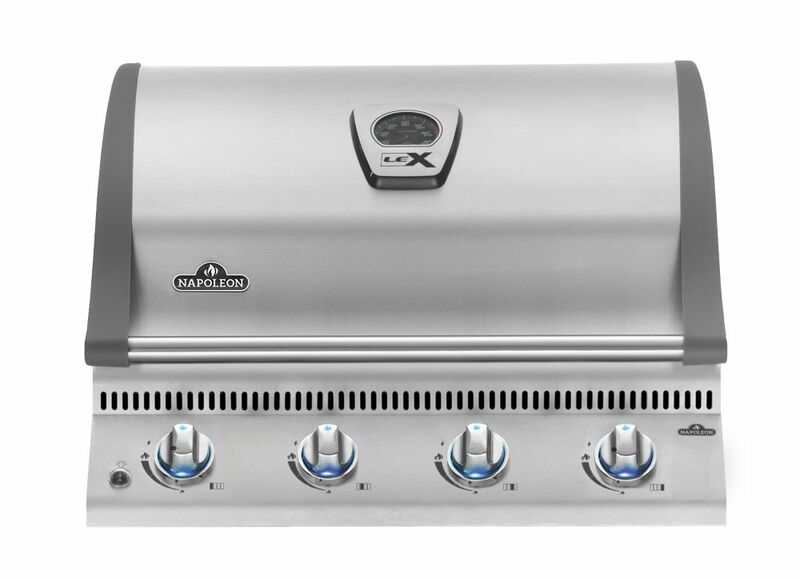 LEX485 Built-In Propane BBQ Expand your kitchen to include the great outdoors; by adding a Built-In LEX 485 Grill Head. Three stainless steel tube burners provide even heating. Use one, two or all three burners to bake, sear and even smoke on this versatile grill. High quality stainless steel cooking grids retain heat and produce the iconic Napoleon wave sear marks. Napoleons JETFIRE ignition system makes sure that your grill lights every time by shooting a jet of flame to light the burners. LEX485 Built-In Propane BBQ is rated 4.3 out of 5 by 9. Rated 5 out of 5 by Fernando from Very easy to assemble..... Very easy to assemble.. Rated 3 out of 5 by JimK from I've only given the "propane version" of this grill a... I've only given the "propane version" of this grill a 3 .. because I really needed the "Natural gas version" .. and the Home Depot website was unclear that there were 2 versions to pick from. Some of this mistake was my fault, but many grills like this have conversion kits which allow you to use one grill for both types of gas .. Napoleon does not. I tried reading thru the documentation online for the grill .. and in the documentation provided .. it talks about both types of gas hook-up's in the document. Unfortunately I didn't realize I'd made a mistake until I was reading other reviews of the product where someone actually asked whether it could be used for either type of gas .. and the responder indicated not. Then, I tried to keep the propane one from shipping .. but was told I had to wait for it to actually arrive .. return it .. then order the correct one. In looking at other websites that sell the Napoleon line of products .. they actually ask you which gas you are trying to hook up to. Home Depot should do something like that as well .. for products like this. I have gotten the correct grill now .. and it was simple to hook up and is working great! Rated 5 out of 5 by Kim from Love this grill! It was easy to install expect for... Love this grill! It was easy to install expect for the lighting rod - the directions really do not explain this item other than in the parts section. The directions are hard to follow but I managed based on the pictures. I am happy with the purchase! Rated 3 out of 5 by JW from Grill was ordered at Home Depot, did not fit cabinet and had to be returned. Grill was ordered at Home Depot, did not fit cabinet and had to be returned. Rated 5 out of 5 by Charkel from BBQ grill This is a very nice looking grill and was easy to install.